CPM fittings: This unique line of in-line fittings are also widely known as "zero dead-leg" fittings. Originally designed for critical pressure applications in the Life Science industry, they are now used in all market segments as a means of eliminating cleaning and sterilization issues that can occur when traditional tees or “instrument tees” are used for mounting process sensors. They are especially effective in viscous fluid food applications where they eliminate hold-up volumes and dead-legs that can be hard to flush and clean. 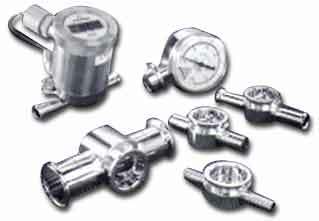 Most of our pressure gauges and transmitters, as well as several other of our process sensors can be specified to mate with these fittings. Thermowells: These are used in any temperature application where a direct immersion sensor is not optimal. Available in both weld-in styles for vessels and in clamp-in styles for process lines, the temperature sensor can be readily removed for calibration or troubleshooting without opening a penetration into the process, so the sterility of the system is maintained during service. Tank Shells (or "Spuds"): These weld-in fittings are used to provide a hygienic means of mounting a flush-mount hydrostatic level sensor into a tank or vessel. The original Anderson flush mount level fitting is available in a short or long version, as are the mating weld-in shells. The short shell is used for single wall tanks with no insulation, heating or cooling jackets. The long version is for all other tanks. There are also heavy-duty versions of each that are designed for pressure or vacuum rated vessels. Finally, we can also supply electronic temperature sensors in this same fitting style for vessels with scraped surface agitators that would damage a direct immersion probe or thermowell.